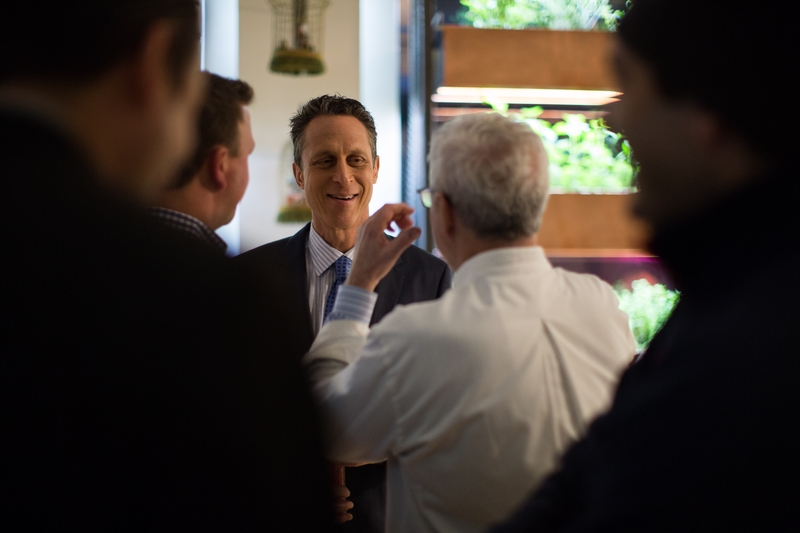 Dr. Mark Hyman meets guests at a party for his new book, “The Blood Sugar Solution: 10-Day Detox Diet,” earlier this year. Hyman embraces a wellness philosophy called “functional medicine,” which addresses the root causes of chronic diseases though dietary and lifestyle changes. Nine years ago, on their 30th wedding anniversary, Hillary Rodham Clinton gave her husband a gift she hoped would ensure many more years together: Dr. Mark Hyman. Hyman was charged with helping the former president after a 2004 quadruple bypass surgery. In the time since, the doctor has become part of the Clintons’ circle of friends and advisers, but one with an important difference. The Clintons, after all, have a small army of aides who offer political and policy advice, but not many who can tell a former and potential president to lay off the ranch dressing. Hyman, who made a name for himself advising the moneyed urbanites who retreat to Canyon Ranch in Lenox, Mass., met Hillary Clinton at a fundraiser in New York when she was in the Senate. The two quickly dived into a wonky conversation about childhood obesity and his philosophy of healthful eating. “She then called me and we’ve just become friends,” he said. Hyman, 54, described it as a learning experience. He had asked her to dinner, he said, and the discussion was about a range of topics from health policy to the Citizens United ruling on campaign contributions, not the former first lady’s health. “We came out after dinner and there was all this press there,” Hyman said (he assumes a restaurant employee alerted the news media). Trained as a family doctor, Hyman, who was born in New York, moved to rural Idaho after medical school to work in a small clinic. He then worked as an emergency room doctor in Massachusetts before becoming co-medical director at Canyon Ranch. More broadly, he embraces a wellness philosophy called “functional medicine,” or the practice of addressing the root causes of chronic diseases (from diabetes and arthritis to insomnia and fatigue) through dietary and lifestyle changes, rather than diagnosing them and prescribing traditional medicine to treat the symptoms. Weight loss is a nice side effect, he said. In February, the doctor made a blitz of media appearances. He stopped by “The Dr. Oz Show” and schmoozed with fans at a book party at Bouley Botanical, an event space in New York run by the chef David Bouley where fresh herbs spill out of containers in the open kitchen and loft windows. But it’s his relationship with the Clintons that brought him the kind of tabloid attention that a doctor with a practice in the scenic Berkshires rarely receives. Meanwhile, there remain genuine concerns about Bill Clinton’s health, even though he is svelte compared with his doughier White House years. Last month, Chelsea Clinton said her 67-year-old dad, who used to famously jog to a McDonald’s and strategize over greasy steaks and tamales at Doe’s Eat Place in Little Rock, Ark., had a heart that was “much younger than it was even 10 years ago.” He is also around 30 pounds thinner than when he was president. Hyman’s is a diet that treats Oreos and Coke like addictive drugs, and that emphasizes the benefits of mostly gluten-free whole foods, proteins and natural fats. Call it the Clinton Cleanse. On the other side of the spectrum is Hillary Clinton, a 66-year-old potential presidential candidate who logged nearly 1 million miles over a four-year period as secretary of state. Hyman carries packets of macadamia nut, walnut or coconut butter in his jacket pocket, and he advises busy clients like her to do the same. Grass-fed beef and turkey jerky and cans of wild salmon are also recommended travel snacks.